Tauopathies are neurodegenerative diseases that are signified by the presence of irregular tangle-like clumps of the protein tau that appear in the brain and accumulate during as the disease progresses. As tau tangles appear in numerous diseases such as Alzheimer’s and progressive supranuclear palsy (PSP), it seemed likely that tau could be a key factor in causing neuron and brain malfunction in these diseases. However, how these diseases are triggered, and whether similar causes could generate these tau protein tangles in all these conditions were unknown. Now, a new study from researchers at Sanford Burnham takes a step forward in understanding how similar, yet genetically unrelated neurodegenerative diseases, such as Alzheimer’s disease, frontal temporal dementia, and PSP are caused by the protein tau. The team states that their new study creates new opportunities to target this key protein that leads to the brain lesions found in patients with impaired motor functions and dementia. The opensource study is published in the journal Neuron. Previous studies show that tau is a protein that maintains the integrity of long hollow tube structures called microtubules, which are major structural elements of cells. In neurons, microtubules form long extensions called axons where signals are rapidly transported over long distances when neurons communicate with each other. When tau becomes abnormally modified by hyperphosphorylation, or cleaved by the enzyme caspase-3, which itself can also facilitate its hyperphosphorylation, it loses its biological activity and goes through conformational changes that allow the protein to accumulate and form tangles. In earlier studies, because it was largely unknown how caspase-3 is triggered to induce tau aggregation in tangles, determining the sequence of events that lead to tau cleavage and aggregation is one of the most important goals for the prevention and treatment of tauopathies. The current study shows a novel role for appoptosin in neurological tauopathy disorders such as PSP. The team explain that PSP, a neurological disease with tau brain aggregates, where patients experience serious problems with balance, eye movement and thinking. By examining patients with PSP, it became apparent that variation in the DNA sequence of a single nucleotide (a SNP) was associated with the disease and correlated with elevated levels of appoptosin that increased caspase-mediated tau cleavage, tau aggregation, and synaptic dysfunction. The lab state that to their knowledge genetic and biological triggers for PSP were previously unknown. Results show that neurodegenerative triggering factors appoptosin and caspase-3 cleaved tau were also found to be overabundant or over-activated in brain samples of patients with Alzheimer’s disease and frontotemporal dementia, supporting the importance of their contribution to these neurodegenerative disorders. Data findings suggest that appoptosin and/or caspase-3 may be potential targets in the treatment of these neurodegenerative diseases. The group state that a better understanding of the mechanisms that cause neurofibrillary tangles is of clinical importance for developing therapeutic strategies to prevent and treat tauopathies. The researchers surmise the the findings show how the abundance of a protein called appoptosin increases tau aggregates called tangles, which are toxic to the brain and lead to the progressive deterioration of the central nervous system. They go on to conclude that by understanding how appoptosin drives this process, the global medical community can now look at ways to inhibit key triggering points and potentially slow the progression of this class of neurodegenerative diseases which are collectively known as tauopathies. neurodegeneration in PSP. 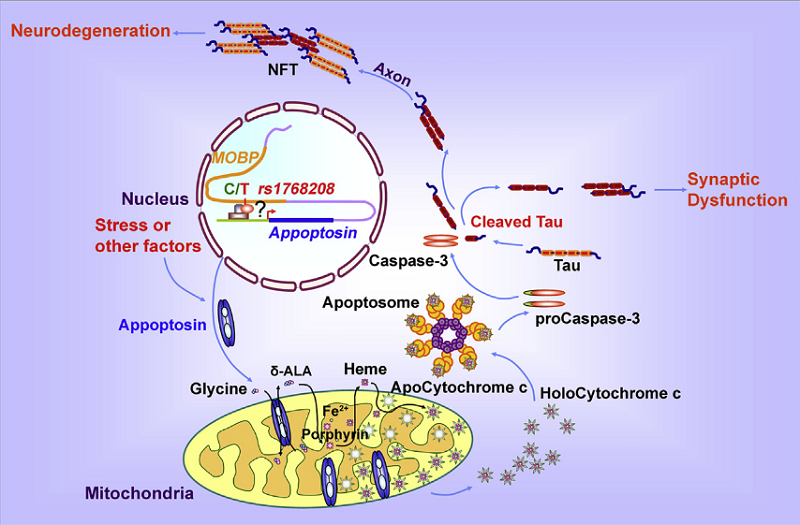 Appoptosin-Mediated Caspase Cleavage of Tau Contributes to Progressive Supranuclear Palsy Pathogenesis. Xu et al 2015.